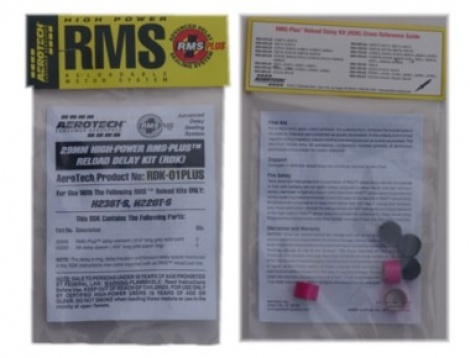 Aerotech HP reload delay kits allow you to modify the delay time of your rocket motor by changing out the standard delay charge that comes with standard RMS reloadable motor propellant kits. Delay kits are available for 29mm, 38mm and 54mm reload kits. Delay time indicators are: S - 6 secs., M - 10 secs., L - 14 secs., X - 18 secs. The RDK kit in the photo is a sample picture only. Price is for one element only. See information below for details of the delay kit product listed.